Since December 14, 2018, several lawsuits have been filed raising various legal challenges to the measures imposed by the lame duck legislation. One of the primary legal challenges to the lame duck legislation is constitutional in nature – i.e., that much of the new legislation’s limiting effects on the executive branch violate the principle of separation of powers embodied in the Wisconsin Constitution. Because of the politically high-stakes nature and actual administrative effects on the powers of the executive and legislative branches that the lame-duck legislation poses, the issue of whether the lame-duck laws violate the Wisconsin Constitution’s principle of separation of powers will more likely than not make it to the Wisconsin Supreme Court. Because the lame-duck legislation is unprecedented in state history in the way it adjusts powers between the executive and legislative branches, there is little on-point case law speaking to the issue. Several cases, however, do shed some light on how the Wisconsin Supreme Court has approached other separation of powers disputes. One case that stands out is State v. Holmes, 106 Wis. 2d 31 (1982). Holmes had to do with a dispute over a statute that gives defendants in Wisconsin state court the unconditional right to request the substitution of the circuit judge in their cases without having to show good cause. Once the substitution request is properly submitted the assigned judge loses all authority over the matter. The issue first came into constitutional dispute in 1980 when a criminal defendant made a request for substitution under the statute in relation to the Polk County circuit judge presiding over his case. In response, the judge issued a memorandum decision declaring the substitution statute an unconstitutional violation of the separation of powers doctrine. The circuit judge contended that judicial substitution is a power inherent only to the judiciary and therefore cannot be encroached upon by acts of the legislature. A similar decision from a Milwaukee County circuit judge came shortly thereafter. On appeal to the Wisconsin Supreme Court, the court unanimously found that the substitution statute was a reasonable exercise of legislative regulation and therefore was not unconstitutional. First, the court noted that while the state constitution does create three coequal branches of government with distinct functions, there exists an “ambiguous territory” of powers between the legislature, executive, and judiciary that should not be be understood as requiring a strict division of functions between each. In recognizing that when the responsibilities of each branch overlap – such as when the legislature wants to ensure that both the practices and appearance of the criminal justice system elicit fairness – a “shared powers” standard operates. Because the intent behind the substitution statute was reasonable in its public policy goal of providing all defendants charged under the legislature’s criminal code the ability to substitute their judge to ensure maximum fairness, there was no unconstitutional infringement of the judiciary’s powers. In addition, the court also noted that there was plenty of historical precedent that permitted defendants to request a new judge if they suspected the possibility of prejudice. 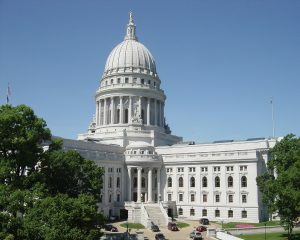 After deciding the constitutionality of the substitution statute, the court took significant time delving into how to approach the separation of powers doctrine in Wisconsin. In attempting to explain where to draw the line around the distinct powers of the judiciary that cannot be limited by the legislature, the court set forth the following general standard: “[u]nder the doctrine of separation of powers, the legislature is prohibited from unduly burdening or substantially interfering with the judicial branch.” Because the substitution statute had a valid public policy goal and did not “practically defeat the exercise of the judicial power or materially impair the operation of the judicial system,” it was allowed to remain in effect. On an advisory level, the court also listed statutory actions that would cross the line into separation of powers violations, such as those that lead to “the disruption of the orderly conduct of judicial business, the demoralization of court dockets, and the threat to judicial independence.” Lastly, for constitutional separation of powers litigation going forward, the court established a high burden of proof. In order to challenge an act by the legislature that limits the powers of one or both of the other branches the petitioners must prove a separation of powers violation beyond a reasonable doubt. A more recent Wisconsin Supreme Court case dealing with the doctrine of separation of powers appears to remain consistent with Holmes, but comes out differently in terms of constitutionality. In Gabler v. Crime Victims Rights Bd., 2017 WI 67, the Wisconsin Supreme Court found that a legislatively-approved executive board that was given the power to review and discipline judges violated the doctrine of separation of powers. The court pointed out that the statutory authorization of the executive branch to discipline and regulate members of the judicial branch substantially interfered with the independence of the judiciary. While acknowledging the many shared powers that the separate branches have, the court pointed out that the regulation of judges squarely falls into the exclusive powers of the judiciary. In light of the foregoing cases, which represent bellwethers for both reasonable and unreasonable intrusions into the separate spheres of the three branches of government, whether the specific limitations imposed on the executive branch by the 2018 lame-duck legislation constitute separation of powers violations remains an open question. It is likely that the Wisconsin Supreme Court will choose to hear this issue at some point, and given the ideological makeup of the current court and interpretable nature of the relevant case law it is hard to predict how they will decide. One point of interest in the Holmes decision was the court’s review of the legislature’s policy intent and historical practice. Therefore, if past precedent is considered in assessing whether the lame-duck laws unduly burden or substantially interfere with the duties of the executive branch, the court will have to assess the reasonableness of the alleged public policy goal of the legislature in passing the lame-duck laws just before a transfer of power and whether there is a valid historical practice of these kinds of actions. In the case of the 2018 lame-duck laws, it will be a challenging feat for legislative Republicans to argue a neutral public policy given how politically-motivated the extraordinary session appeared to the general public. Furthermore, had the election gone the other way it seems more likely than not that the extraordinary session and resultant lame-duck laws that took power from an incoming Democrat and ceded it to a branch controlled by Republicans would have never even occurred. Lastly, there is little to no historical precedent for the specific limitations imposed on the executive branch. However, on the other hand, the plaintiffs are going to have to prove a material impairment or practical defeat of the proper functioning of the executive branch to the currently conservative Wisconsin Supreme Court beyond a reasonable doubt – which itself will be a tall order. Whether or not the Wisconsin legal community and public at large believes the 2018 lame-duck laws violate the separation of powers doctrine, I am confident that most are able to agree that the political precedent set by the lame-duck legislation is, at best, a dubious one for future generations of leadership in the state capitol. Setting a precedent that encourages outgoing leaders to attempt to hamstring their successors contradicts a longstanding Wisconsin tradition of respectful and peaceful transfers of power. As time passes the political pendulum swings back and forth, and the tactics that could benefit one party today may subsequently be turned around and used on that same party down the line when they eventually lose power. At the end of the day, the Wisconsin Supreme Court will undoubtedly have a major decision to make with broad legal and political ramifications should they decide to hear the separation of powers issue presented by the 2018 lame-duck legislation. On the most fundamental level, the actions of the lame duck state legislature are anti-democratic. The State of Wisconsin elected Tony Evers Governor, and voters justifiably expect him to carry out the policy changes he put forward in his campaign. Unfortunately, this is not the first time that the Republican-controlled legislature has acted in an anti-democratic way. Its effort to reduce voter registration and participation is another example that springs to mind. The legislature’s attraction to anti-democratic authoritarianism has a long history.